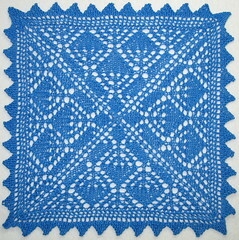 This is a charted cloth pattern done with Louet Euroflax linen on size 1 (2.50 mm) needles. I found the Euroflax linen to be much more pleasant to knit with if I wash and hang dry the skein before winding it into a ball. I found it to be tricky to keep stitches even when it isn't washed first because the linen is a bit stiff. The more this cloth is washed the softer and softer it will become. 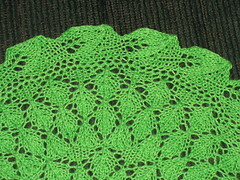 The finished size is about 7 3/4" by 7 3/4" (55 sts). The chart is very colorful and hopefully that will make it easy to read. 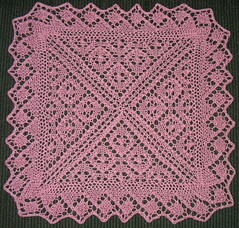 hi there I love the dishcloth would you be able to post the whole pattern as I don't know how to read a pattern yet and I would really like to make a few of these cloths.. 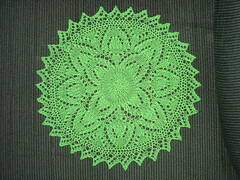 The whole pattern is posted in the pdf but it is a charted pattern. Here is a link to help you learn how to read charts. Also if you knit a cloth that has both written directions and charted directions that will help tremendously in learning how to read directly from the chart. 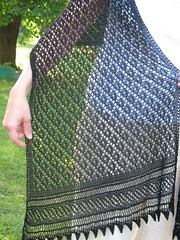 The Lean to the Left cloth pattern has both the written and charted patterns available. Here is the link for the Lean to the Left pattern.